Moving house is a big event in life and a considerably harder task when you are moving to another country. We at Ireland Removals are experts at international removals to Ireland and can be of assistance with all your moving needs. We supply a range of services to make moving home easier for you. Don’t be disheartened if you are moving to another country; it doesn’t have to be as costly as you may think. 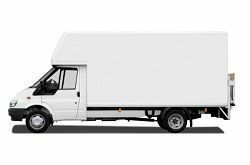 Our man with van service is a popular way to transfer a reasonable amount of goods at an affordable cost. Nothing beats our man and van hire – it is reliable and trusted and will make your move easy. For a free consultation call 020 8746 9615 today. We are here to help with all of your moving requirements. Whether you are a business or a home owner and need to ship a consignment of goods to Ireland, hire us. We are a long established company with various resources to help make a move easier. Our man with a van option is a good idea if you have a smaller load. The advantage is that you get a qualified driver to securely load and transport your possessions to Ireland. We offer a guaranteed man with van hire that we know you will be pleased with. All our vehicles are modern and equipped with satellite navigation. Plus, you get a choice in size, so what could be better? Don’t be put off taking your belongings abroad. It is not a complicated process - it simply needs those who are experienced on board! With our years of experience behind us, we will plan a unique move to suit your circumstances. We are an award winning company with knowledge in house removals. Our man with a van service is here to move almost anything safely to your new destination. We have years of practice in moving clients overseas. You can rely on our drivers to do a first-class job. We are available 24/7 and here to offer advice and support when you need it. Feel free to call 020 8746 9615 now and reserve your appointment. Our friendly and helpful customer service is here to answer your queries. Don’t be tempted to sell up and get rid of personal memorabilia and precious belongings that have been in the family for years when moving abroad. If you want an affordable removal service hire our man and a van service. It is a combined package where you get two services in one, a skilled driver who will safely pack up the van and fasten it down and drive it. We have everything safely covered with the crucial insurances, health and safety insurance. You can have confidence in us to do a smart move. Our deliveries are reliable and prompt and we will get the job done efficiently. We at Ireland Removals are the best when it comes to supplying man and van services. Nothing beats our competitive rates. You will be impressed with our skilled staff members. We are knowledgeable on what documents and permits are needed when moving belongings overseas to Ireland. Our vehicles are reliable and will safely move your load. We are at the top of the game when it comes to man with van hire services. You can trust us to offer the best value moving packages. For more details or a free estimate call 020 8746 9615 now.